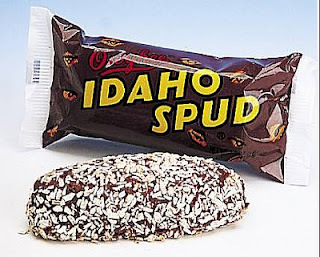 Idaho Spud Bar - First manufactured in 1918, the Idaho Spud Bar has a soft marshmallow center, dark chocolate coating and sprinkled with coconut. Shaped like a potato this candy bar is sure to please anyone. Mainly popular in the Northeast it has been one of the top 100 selling candies there for years. Fredericksburg Fudge - A local favorite, we have brought the fudge back in for the fall. Featuring a Dark Chocolate Fudge, Maple Nut Fudge, Milk Chocolate with Pecans and new this year the German Chocolate Fudge. Sold in half pound tubs, it is a sweet snack with a much shorter drive to Carrollton than to Fredericksburg! Brittle - New to us this fall also are Fredricksburg Fudge's Brittle Candies. We've brought in both a traditional Peanut Brittle but also a Jalepeno Brittle. Slightly hot with a sweet salty aftertaste its sure to please the Jalepeno lover in your life. Stop by and give it a try! More updates to come as we start to put out the Halloween Candies!